Enactus Ryerson attended the Enactus World Cup at the end of this past year and we have our VP of Projects, Dilpreet giving you the inside scoop. The following blog post is a guest blog written by Dilpreet Matharoo. The Enactus World cup showcases the world’s brightest leaders who are helping create change in communities in need around the world, through entrepreneurship. This past October I got to travel to San Jose California with a team of six to experience the Enactus World Cup. There were 35 countries from around the world who came together to compete on the impact that they created over the past year. Every year each branch of Enactus is given the chance to compete in order establish a sense of competition that can be used to drive more success in Enactus projects, and more social change as a whole. While on the trip, I met people from Germany, Tunisia, South Korea, and India, there was a total of over 3500 people all from different backgrounds, who at a core, had very similar beliefs as me. It was refreshing for me to be able to meet new people and feel that I'm talking to old friends. I don't think I’ve ever experienced that elsewhere. 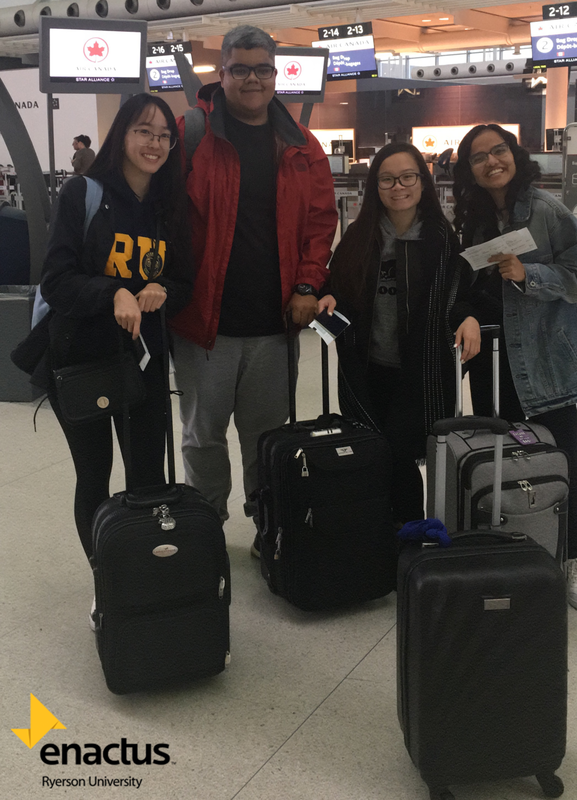 Enactus Ryerson at the Airport heading to San Jose. Even though Enactus Ryerson wasn’t competing in the World Cup, I am glad that I was able to compete at the regional and national levels in Canada which led to me spectating in the World Cup. We had the opportunity to cheer on Team Canada which was lead by Enactus Lambton College, who awed the crowd with their outstanding impact in Zambia and won the 2018 Enactus World Cup. After being crowned the winner, the Canadian delegates captured the whole auditorium while singing our national anthem in unison, which was an experience that gave me goosebumps. One thing that will always stick with me is the fact that I can always do more, to do better. Meaning that I should be doing everything in my power, to help others who may not have the ability to do so. Lambton College, the team who was representing Canada, has been able to completely transform Zambian farmers over the past 6 years by introducing them to new farming technologies and creating more local businesses through entrepreneurship. They were able to take the lower class, and create a new middle class through engaging with the community, helping them in a way that empowered them to help themselves. Ever since we came back from the trip, I feel more ready to actually start executing ideas that I’ve had, and I am even more eager to continue to make change.